Armed with a notepad and pen, my trusty MacBook, and the desire to be the best domestic goddess I can be, I will watch the show from the beginning and find the lesson in each episode. Consider this your Cliff’s Notes on household harmony. We all need to be reminded that we are valued and loved. There is no shame in calling in professional help. Support the ones you love and accept their support when you need it. When facing adversity, the right LBD can see you through. Make time to romance your spouse. 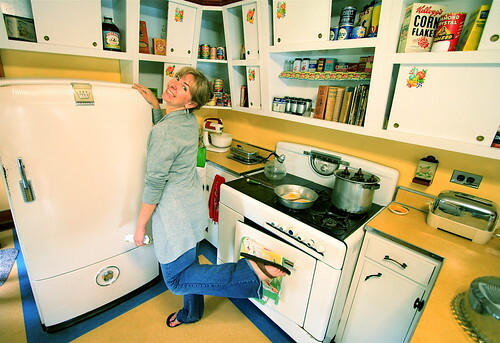 At the top, by the way, is Sandee celebrating the discovery of a perfectly preserved 1950s kitchen at the Shelburne Museum in Shelburne, Vermont.